Katie B Temple is a visual artist who lives and works in Omaha, Nebraska. Temple earned her BFA from Bowling Green State University in 2010 and her MFA from Montana State University in 2013. 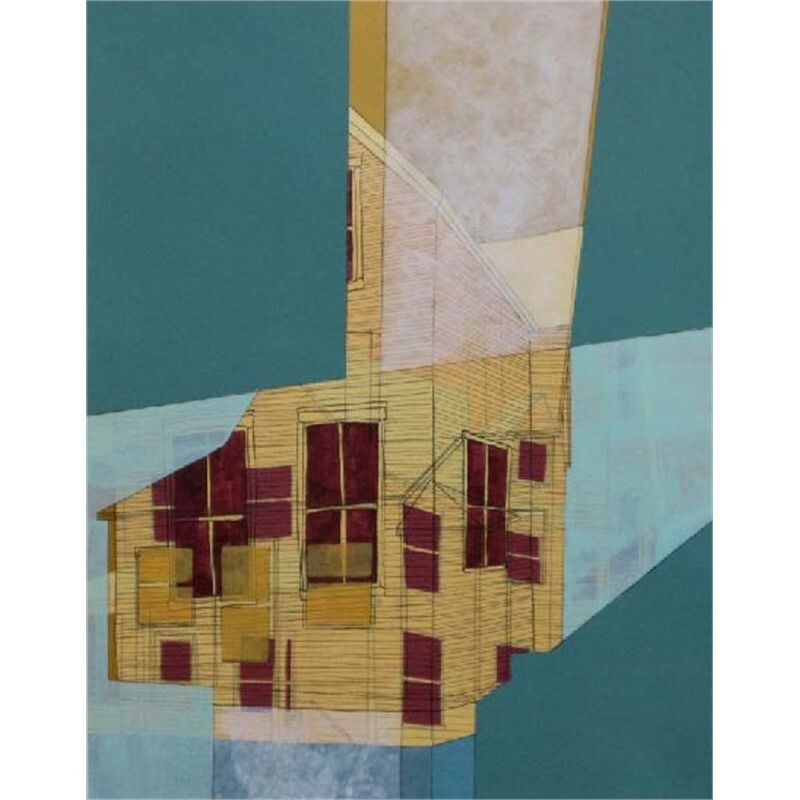 A former nomad who has lived in Ohio, Montana, and Illinois; her vibrant, architectural paintings pay homage to Omaha, her permanent home sweet home. 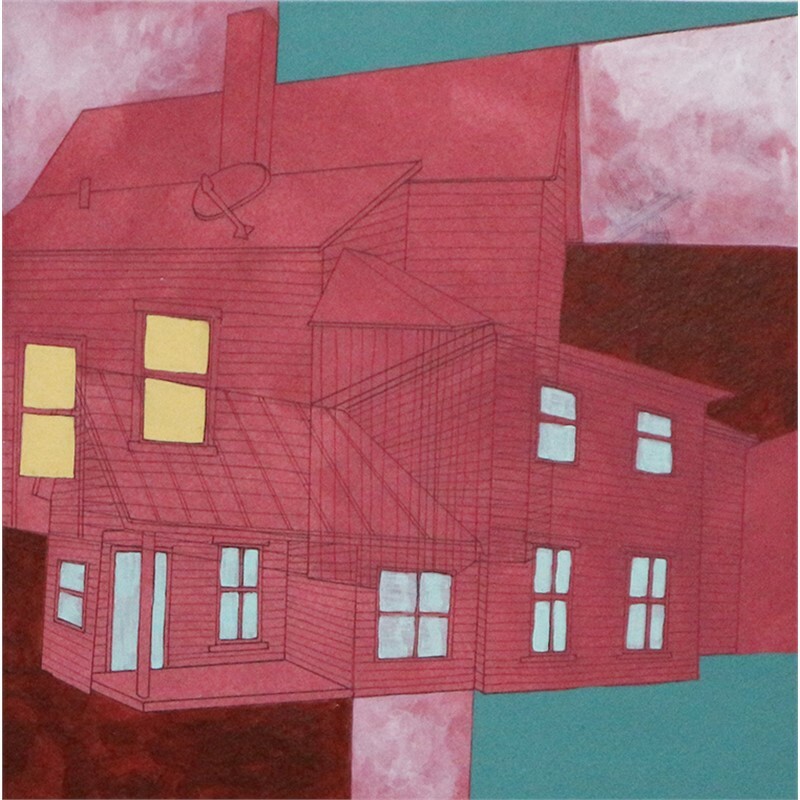 Inspired by homes of her past and homes of her future, Temple’s distinctive, graphic style has allowed her to be an active exhibitor in the Omaha Metro, landing in the top-10 list of "Best Exhibitions of 2016 in Omaha" by TheReader.Com for her 'Sense of Home' solo exhibition at the Michael Phipps Gallery. She has been a nominee for Best Visual Emerging Artist for the 2017 and 2018 Omaha Arts and Entertainment Awards. Recently, Temple was nominated for two 2019 Omaha Art and Entertainment Awards including: Best Visual Artist and Best Solo Exhibition for her exhibition Home Sweet Home at The Little Gallery. She looks forward to her upcoming solo exhibitions at the Norfolk Arts Center and Nebraska Governor’s Residence in 2020. As a full-time artist, Temple’s passion for the arts moves beyond her studio walls into the local community. She is the Studio Manager for Joslyn Art Museum’s Kent Bellows Mentoring Program; an interdisciplinary art studio for teens to explore, observe, think, and create in the arts. She has been involved in a variety of community projects including creating a custom piece for the Benson Theatre’s fundraising campaign, painting a fiberglass sculpture for the Cozad Community Foundation, and holding visual arts workshops in schools of underserved areas of Omaha. 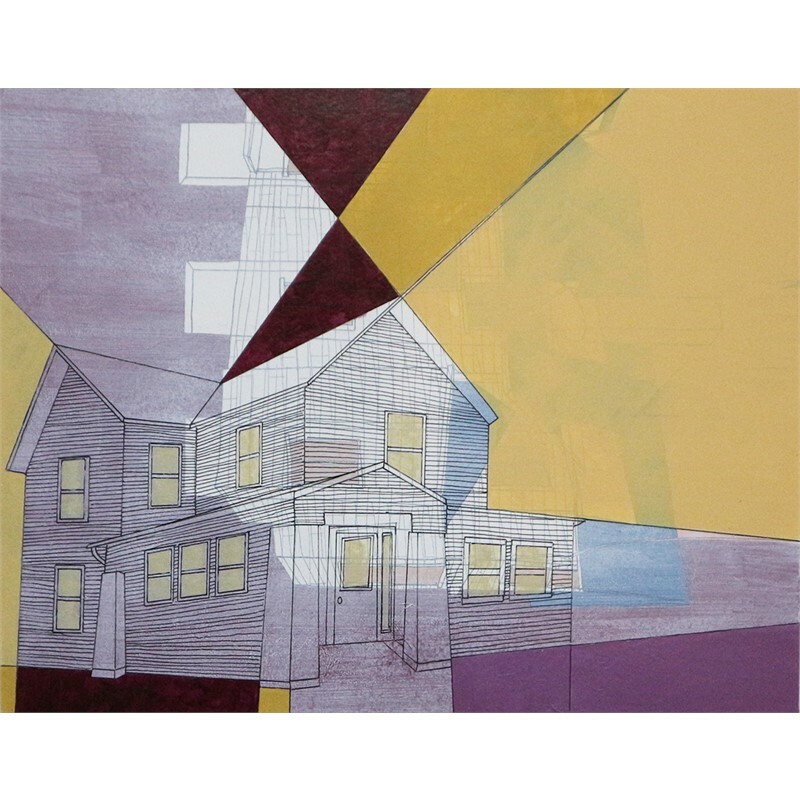 The vibrant, architectural paintings that I create are inspired by ‘empty’ homes located in my neighborhood. ‘Empty’ refers to homes that are not currently occupied. They may be between renters, on the market to sell, foreclosed by the bank, or just abandoned. These homes sit vacant without any belongings or people and are seen as blank vessels awaiting their next possessor. 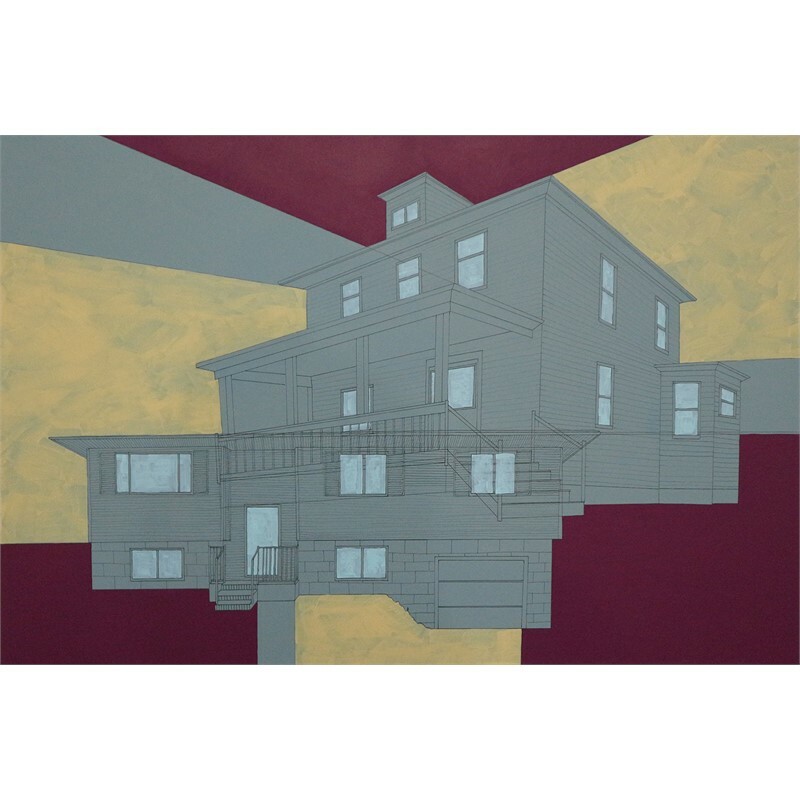 By constructing and layering multiple buildings on top of each other in a single painting, I reproduce the situation of homes transitioning from one resident to the next or from occupied to foreclosed. The structural play of transparent and opaque color blocking in the paintings present a whirlwind of visual incident. Painting these homes has allowed me to reflect on the 15 different buildings I have called ‘home’ throughout my life and how they each were a vessel that held me. The idea of home is about way more than just the physical structure, it is also a feeling and emotional response to a specific place. Each home I have lived in was a place I belonged to; a place of comfort and safety. I called them each home for different reasons and those reasons transitioned as I moved one place to another. The use of vibrant colors allows me to bring life, memory, and personality back into these uninhabited homes; with my color palette inspired by the external house color. Katie B Temple is a visual artist who lives and works in Omaha, Nebraska. Temple earned her BFA from Bowling Green State University in 2010 and her MFA from Montana State University in 2013. 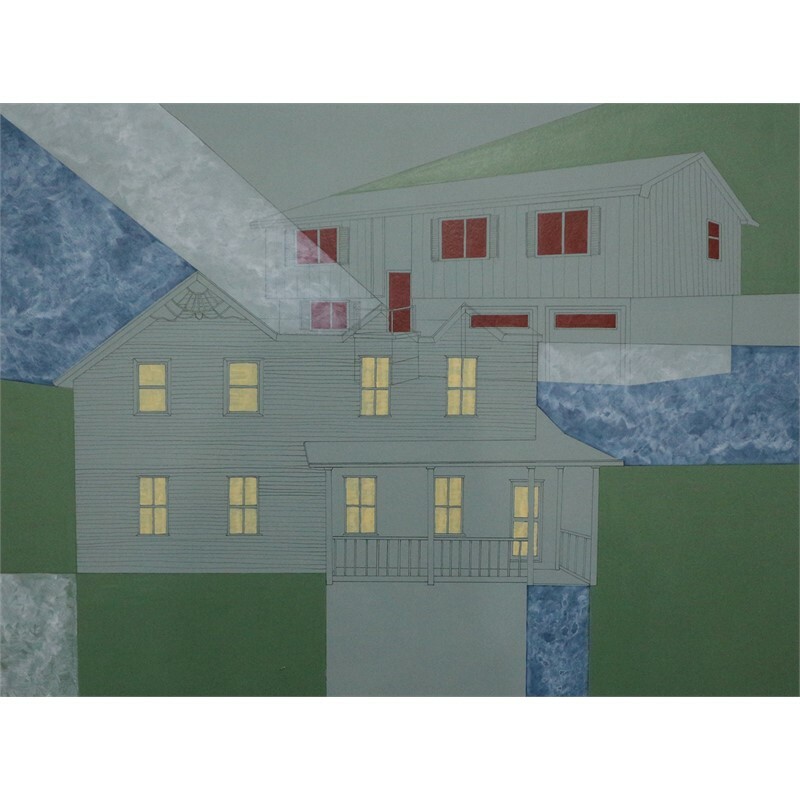 A former nomad who has lived in Ohio, Montana, and Illinois; her vibrant, architectural paintings pay homage to Omaha, her permanent home sweet home. 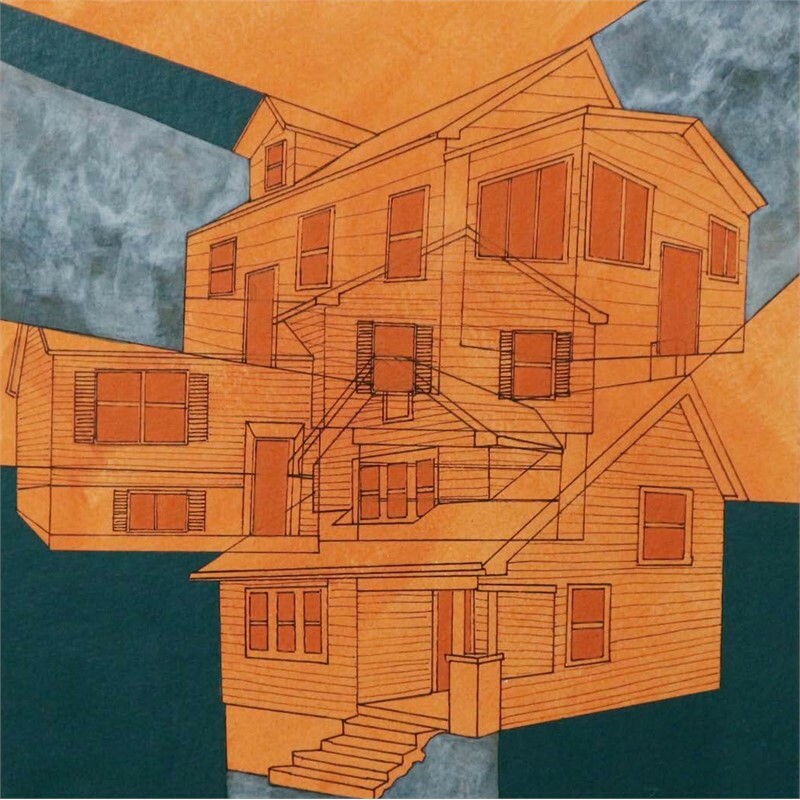 Inspired by homes of her past and homes of her future, Temple’s distinctive, graphic style has allowed her to be an active exhibitor in the Omaha Metro, landing in the top-10 list of "Best Exhibitions of 2016 in Omaha" by TheReader.Com for her 'Sense of Home' solo exhibition at the Michael Phipps Gallery. She has been a nominee for Best Visual Emerging Artist for the 2017 and 2018 Omaha Arts and Entertainment Awards. Recently, Temple was nominated for two 2019 Omaha Art and Entertainment Awards including: Best Visual Artist and Best Solo Exhibition for her exhibition Home Sweet Home at The Little Gallery. She looks forward to her upcoming solo exhibitions at the Norfolk Arts Center and Nebraska Governor’s Residence in 2020. As a full-time artist, Temple’s passion for the arts moves beyond her studio walls into the local community. She is the Studio Manager for Joslyn Art Museum’s Kent Bellows Mentoring Program; an interdisciplinary art studio for teens to explore, observe, think, and create in the arts. She has been involved in a variety of community projects including creating a custom piece for the Benson Theatre’s fundraising campaign, painting a fiberglass sculpture for the Cozad Community Foundation, and holding visual arts workshops in schools of underserved areas of Omaha. 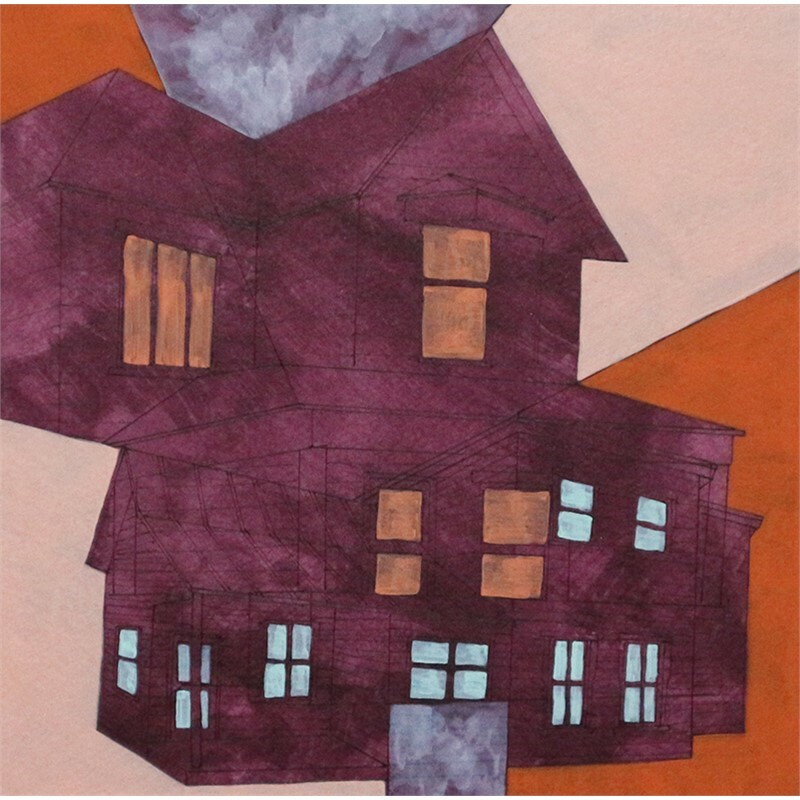 ARTIST STATEMENT The vibrant, architectural paintings that I create are inspired by ‘empty’ homes located in my neighborhood. ‘Empty’ refers to homes that are not currently occupied. They may be between renters, on the market to sell, foreclosed by the bank, or just abandoned. These homes sit vacant without any belongings or people and are seen as blank vessels awaiting their next possessor. 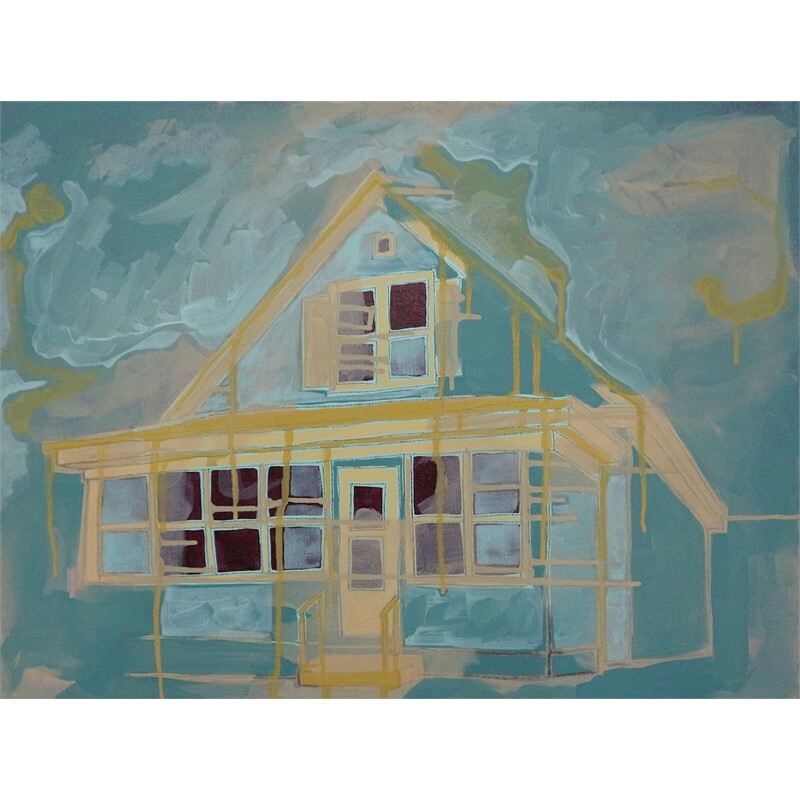 By constructing and layering multiple buildings on top of each other in a single painting, I reproduce the situation of homes transitioning from one resident to the next or from occupied to foreclosed. The structural play of transparent and opaque color blocking in the paintings present a whirlwind of visual incident. 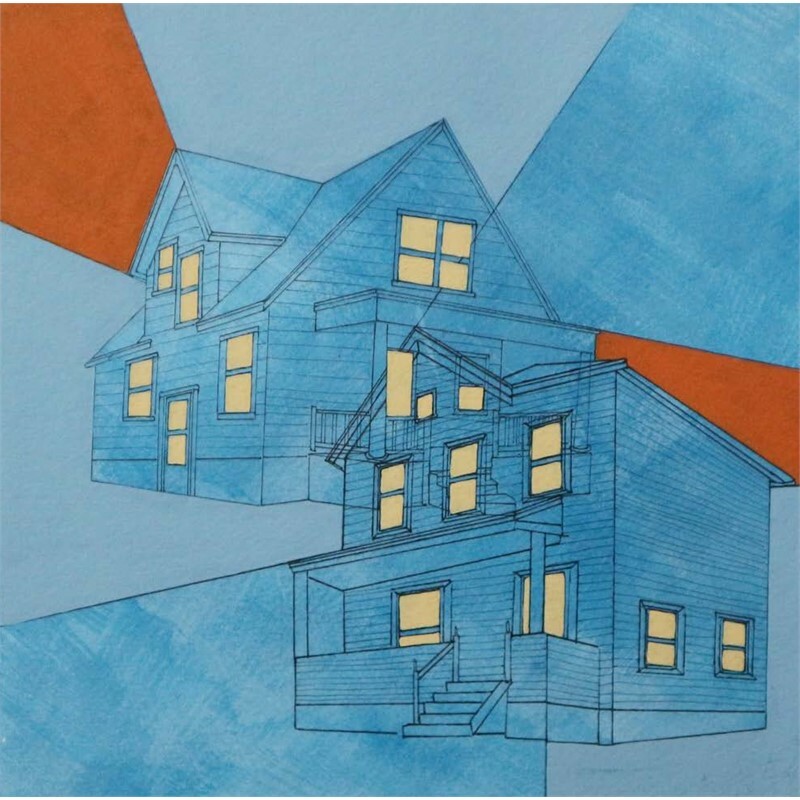 Painting these homes has allowed me to reflect on the 15 different buildings I have called ‘home’ throughout my life and how they each were a vessel that held me. The idea of home is about way more than just the physical structure, it is also a feeling and emotional response to a specific place. Each home I have lived in was a place I belonged to; a place of comfort and safety. I called them each home for different reasons and those reasons transitioned as I moved one place to another. The use of vibrant colors allows me to bring life, memory, and personality back into these uninhabited homes; with my color palette inspired by the external house color.